We are proud to have completed this project. It’s worth doing things which can really help other people – please click and pay it forward! 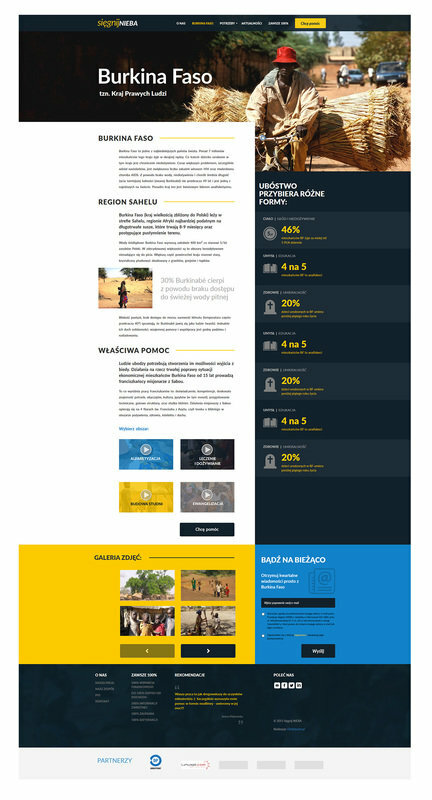 Main page of the Foundation website. The mission of the Sięgnij Nieba (Reach the SKY Foundation) is to disseminate the idea of helping people in need. The Foundation counts on effectiveness – it doesn’t create any additional administrative organizations; it relies on experience, knowledge and organizational capabilities of selected institutions. This way, promotion of helping people in need is the most effective and reaches the people it has been designed for. Without intermediaries and unnecessary costs. The ambition of the Team is to have the real financial support reach directly the people in need. That is why all expenses related to running the Foundation arecovered by its members, where as your donations are used to finance a given target. The Foundation's work is focused on helping disadvantaged people in Burkina Faso. Helping others is like art – it has no boundaries. On the website donors will find a clearly described way to get a full or partial tax reimbursement pertaining to their donations – it’s worth checking how the good comes back to you! Come and visit the Foundation website.